I am always amazed at what inspiration come from the food blog community. There are wise words of wisdom, quirky anecdotes, and most of all, tons of amazing food. Every time I check out my favorite blogs, I find myself making notes on things I want to try or ideas I have for recipes. When I saw Shanna’s Thai Chicken Curry, I knew I wanted to make something spicy and fragrant. 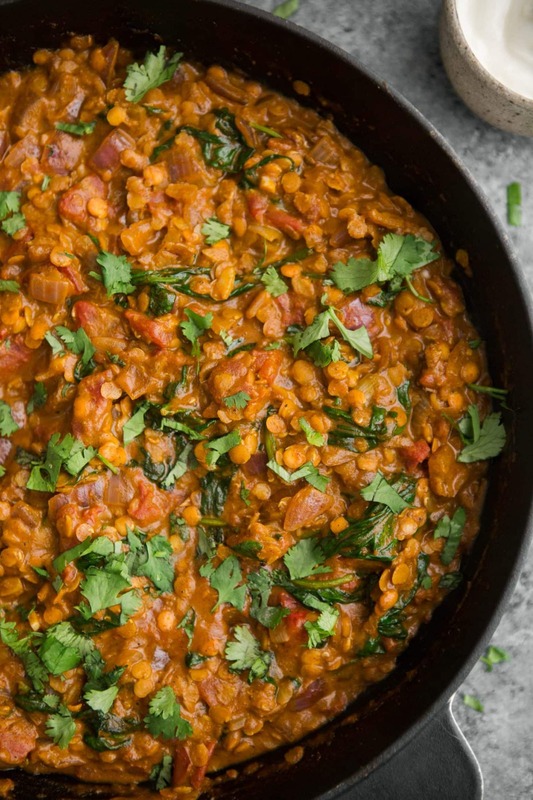 I wanted a big dish of comfort and that’s exactly what I lentil masala. I did a bunch of searching and finally settled on adapting this Tikka Masala (without the tikka of course). This lentil masala has become my favorite lentil dish and the masala paste can be used for other meals, like this masala potatoes and fried egg skillet. Make a large batch of the paste and freeze to use in meals throughout the months! The paste definitely has a kick to it but it’s my favorite kind where you taste the spices and then the heat hits in the back of your mouth. 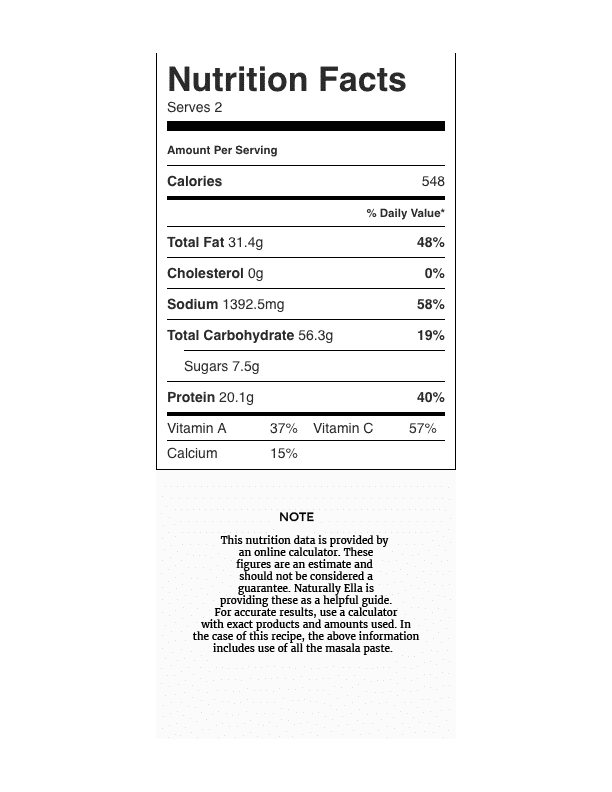 Don’t be too intimidated with the long list of ingredients. I had everything in my cupboard, but they can be found easily in the grocery store if you don’t have something on hand. 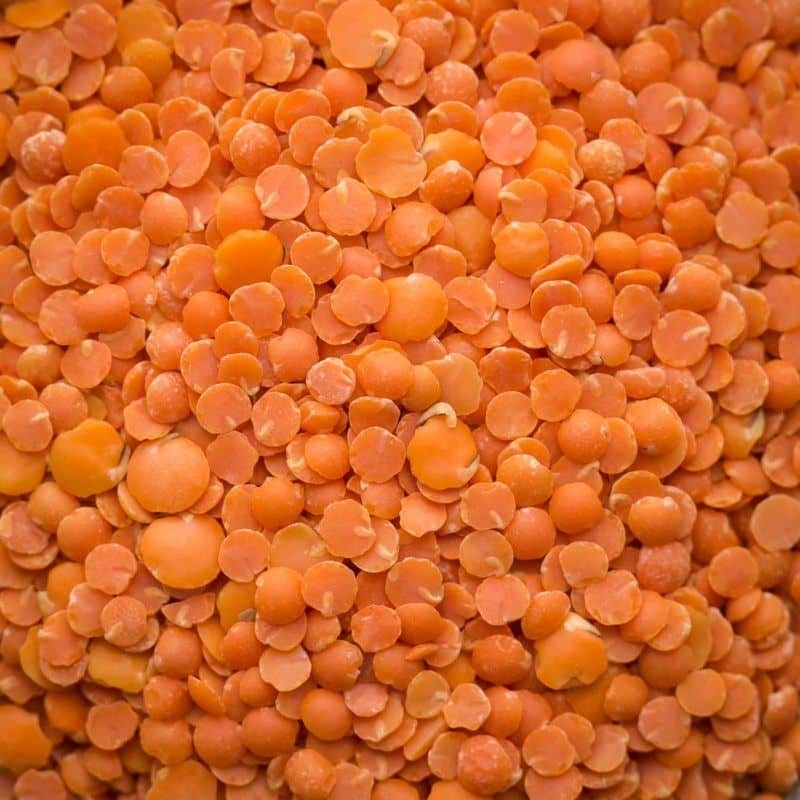 Lentils: I’ve expressed my love of lentils before but I rarely showcase red lentils. Red lentils have a tendency to turn to mush when cooked. But for this dish, I opted to stand and check them every so often and removed from heat before my lentils disappeared. Other lentils can be used but extra liquid may be needed and the cooking time will increase. Greens: I always have spinach on hand but kale or chard would easily work in place of the spinach (or use a mix of greens). Use up the paste: Don’t worry if you have extra masala paste to use. You can keep for later use in another round of this dish or make something like this egg skillet with masala potatoes. 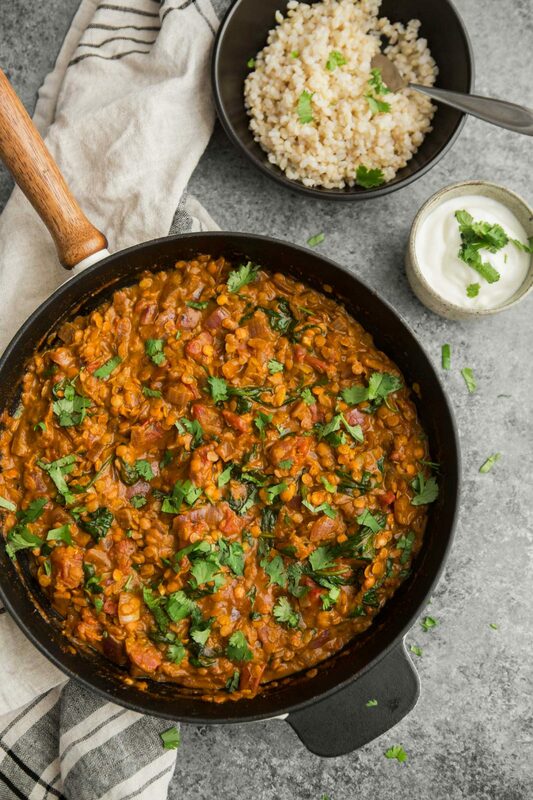 Check out the comments: Many people have made this lentil masala and there’s quite a good bit of information in the comments below! Recipe originally posted on November 23rd, 2012. Last updated on August 27th, 2016. This looks right up my alley! Love all the spices in it… although I am tempted to make a double batch since I adore lentils. Would the masala be enough for two batches? All I have to say is YES. Yum! This looks like the sort of meal I need after a night of mashed potatoes, sweet potatoes, and heavy duty pie consumption. I just recently made a chana masala with a similar type of spice paste; the smell as it cooked about drove me insane and the resulting dish was more flavorful than I could have possibly imagined. I do the same when cooking with red lentils, as I much prefer the texture of whole than that of mush. Beautiful dish! I’m an Indian but rarely cook like this. My mom can’t bear spicy food too, this looks delicious & I’m totally looking forward to trying it. I noticed you used coconut vs olive oil, just out of curiosity: do you bake with it too? And find it fairly versatile/useable for lots of other things? I’m just now working my way in to using coconut oil more but my mother swears by it. She’ll bake with it, cook up french toast in it, etc. If you find a good brand, it doesn’t have a heavy coconut flavor which makes it nice for baking! That’s exactly what I thought, I’ll use this recipe tomorrow. Thank you. Yum! Chicken tikka masala is probably the dish I miss the most since cutting out meat and dairy. Can’t wait to try this variation! Thank you for the inspiration. I made something similar and it was nice. Enjoyed by all. Delicious flavor, but WHEW spicy! I think I’d cut down on the red pepper and ginger next time. Great recipe though. You make simple things look amazing Ella! The lentils look like they’d make a super comforting meal. I made this for dinner last night, and it’s great! My husband loved it to and has already said it should go on our favorites list. I subbed in kale for the spinach and cut back on the red pepper a little but otherwise followed the recipe. Thanks Erin! I have to follow up to my previous post… my husband already asked me to make this again, within a week of the first time I made it, so I made a double batch this time. It’s nice to have something healthy to eat during the holidays to balance out everything else we’re eating that’s not so healthy! Oh my, this is soooooo spicy, I am in the process of trying to double (triple) the ingredients to cut down on this so we can eat it. BTW we love very spicy foods. I love spicy food as well and this is so, so spicy! It’s a delicious recipe but the amount of spice takes away some of the delicious flavors. I would cut the spice in half, or maybe more. Excellent recipe though. Used kale, love it. just discovered your site and this looks amazing! do i spy wheat berries paired with this? i have some in my pantry that i need to get brave enough to use. I need to make a double batch of this next time. It was so good! I have also tried tastespace’s version of this, but in both cases my lentils dry out before the time is up. I had to add water to this to finish the cooking process. It had a surprisingly sweet note to it, and I couldn’t figure out how that happened, then realized – cocount milk! (or the red onion?) It did not taste like coconut at all though. And thanks for the red pepper flake warning. I used only 1/4tsp and still felt a burn. Erin, this was wonderful! Even if I doubled the amount of lentils (and probably used more than 1/3 cup of masala paste. . After years of using the same red lentils recipe I can finally found a great variation. This was great! Usually when cooking Indian recipes, we double the spices, but this was perfect! This was a lovely dish! I did add vegetable broth to keep my lentils soft and cooking. Thank you for the recipe! You’re welcome-glad you liked it! This recipe is amazing. I think I made it every week for nearly two months after I discovered it. I prefer kale to spinach and find that it stands up to heating and reheating for lunch better. I’ve started making 4x of the original recipe so we can have it for supper once and I have enough for lunches for the week. Great recipe! That’s great! Kale is something I don’t use a lot but I can image it would be great in this! Do you know how well the masala paste keeps in the fridge / freezer? Wondering the same thing here. We made a bit extra and are saving some to mix in with a potato hash with eggs for breakfast one morning! I’ve usually used it up with in a couple of days but I think it would freeze really well for a few months! I’ve had this recipe pinned to a Health Kick board on Pinterest for ages and tonight I finally made it. Wow! Loved the combination of flavours. I made it with half red lentils and half pearl barley which added a lovely nuttiness to the flavour and bite to the texture. Have so many more of your recipes lined up to cook this month! I doubled everything and the paste made enough for three batches, not two, so that’s in a little jar in my freezer waiting for a use. This really doubled well because then I could use a whole can of tomatoes and a whole can of coconut milk but I had to keep adding a few Tbls of water every few minutes and cooking my lentils for an extra 20 because they just wouldn’t soften and the curry was getting very thick and gloopy. In the end, this is one of my new favorites (and I’ll just make massive batches of the curry paste to freeze in 2/3 cup at a time so that I can make this straight out of the pantry. Thanks for sharing! PS- assuming 3 servings per recipe (or 6 for my doubled batch), it is 9 PointsPlus per serving on Weight Watchers. Not bad! This was delicious!! Will add this to my list of favourites. I just made this and my partner and I loved it! The yoghurt is absolutely essential as its sharpness cuts wonderfully through the masala. I did find that I needed to add a lot of water throughout to keep the right consistency but other than that, it all went well! Thank you for making me begin to appreciate vegetarian food! It says red lentils but the pictures show black lentils? Also I’m thinking of cooking the spinach with the daal. The lentils pictured are red lentils! I’m sure black would work as well, just needed an adjustment for cooking time. This recipe is AMAZING! I have made it on numerous occasions, often for guests and everyone always requests the recipe. This is one of my go-to easy meals. It all comes together very quickly and tastes incredible! I wanted to like this recipe. In the end it balanced out ok with the yogurt and cilantro but I think a whole tablespoon of smoked paprika was too much. We eat vegetarian every other day and I’m always searching for new ideas. This recipe is fabulous! I’ve tried a couple of different chicken tikka masala recipes and neither made a paste like this. I loved it!!! I used chard because that’s what was in my CSA box for this week, cooking it the whole time with the lentils, and I also had to leave out the red pepper to suit my 4 & 9 yo’s tastes. My husband and I missed the spice but the entire family gobbled it up! I’ll be making a huge batch to freeze leftovers next time. Thank you! I made this last night and it was outstanding! I do make a chicken tikka masala which is rather time consuming (+ delicious), but everyone agreed this was much more flavorful and SO quick to prepare. The paste made enough for 2 batches, so I froze the other half for a future meal. I served it with saffron rice + garlic naan and some cauliflower roasted with cumin. We were still raving about this morning when we woke up! can’t wait to make it again and share it with friends. This was gorgeous. Fun to make, the house smelled wonderful and it was so rich and filling. Perfect rainy day dish. Thank you! Just gotta say … this is *so* Good! Erin, this is delicious. I piled all of the ingredients except for the lentils into the blender to create a smooth raw sauce first (including tomatoes, garlic, onion, coconut milk), and then simmered the sauce and the (Puy) lentils together for 30 minutes & served it over a some cooked oat groats. Amazing. We’ll be making this again. Thanks for another great recipe! I had this pinned forever, and finally made it tonight. Oh my gosh, we loved it so much. I’m so glad we doubled the recipe because I can’t wait to have it for lunch tomorrow! I only used finely chopped kale instead of spinach. I can’t say enough how awesome it was. Thank you! I made this dish last night. It was FANTASTIC. Thinking of my two kids, I cut back on red pepper flakes to a scant 1 tsp, and it seemed perfect (my husband and I would have spiced it up with more). I made a HUGE mistake and it still came out delicious. Don’t ask me what I was thinking…I put in a TABLESPOON of salt instead of a tsp. When I tasted the masala, it was so salty I almost cried. I decided to proceed anyway, and added lots of spinach and then made farro (with NO salt) so I could mix it all together at the end to help compensate for all the sodium. But when my hubby and I tasted the masala as it cooked with the lentils, the salt was not pronounced at all, so we served it as is (no farro). Nonetheless, I won’t be making that mistake again! This is on my keeper list. Really yummy! I made this dish tonight, and it turned out great! It will definitely go into the regular rotation. I did 1/5 tsp. of red pepper flakes and found it to medium spicy – perfect for me. The directions were easy to follow and the result was excellent. I served with a side of pearled barley. Thanks for the recipe! Delicious! We made had this for dinner last night and it loved how flavorful, filling and comforting this dish is! Next time we’ll double/triple the recipe because I’d love leftovers 🙂 Thinking of adding green peas next time. Wow, delish! Thank you for sharing! What a delicious bowl of savory goodness! YUM! Just prepared (and devoured!) 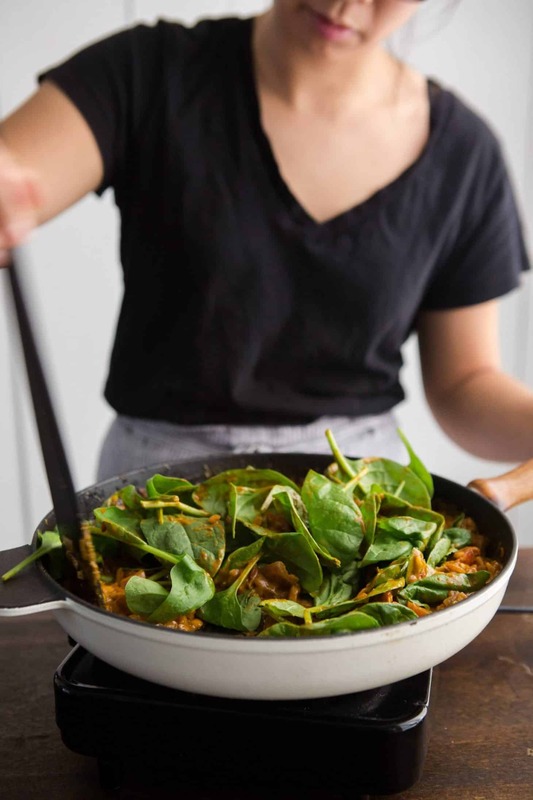 your lovely red lentil and spinach masala. It was fabulous — this recipe is going on heavy rotation throughout the winter. Thank you! After being criticized by a co worker for not cooking with lentils, I went on a search for a recipe that appealed to my tastes, and stumbled upon this one. I have to say, it was very very good. I unfortunately didn’t have paprika on hand, but made it without, and it did not disappoint what so ever. This was a great first recipe to hopefully convert this carnivore into eating more vegetarian meals. Thanks so much! YES! You picked a good recipe to start with! Hopefully you find more veg-friendly meals you like! This recipe is absolutely delicious! I made it for myself & my husband tonight and we were both so impressed with the flavors. The addition of the dollop of yogurt made this dish decadent (despite using fat free Fage’). The only change I made was not using seeds simply because I didn’t have any on hand so I just used the ground spices. I doubled the recipe and now have serving size portions in the freezer for those evenings I just don’t feel like cooking. I didn’t, most likely it’s a browser issue. What ingredients have the box? I’ll try and fix it. Good Evening Erin. The boxes were on the Cilantro Leaves and on the Garam Masam Paste. Thank You Very Much. I’m a lentil virgin, but looking to branch out…do you have to soak the lentils first? Hi Leia, You don’t need to soak the lentils (they are relatively quick cooking) but some people do soak them to aid in digestion! Absolutely delicious. Made this last night and everyone loved it. Thanks, this is a keeper. Could you sub diced or crushed tomatoes for the stewed? Yes- I usually just have stewed on hand but either would work! I love spicy food and it is full of spices. Thanks for sharing. Thanks for this recipe. I have to say it was nowhere near as spicy as some of the comments suggest, and I used the full amount of chilli flakes. Will definitely make again but use my extra hot paprika! Why is the nut oil added besides of the binding aspect? Is there a flavor component that it adds to the dish? And can it be substituted for a non nut oil? There is a hint of flavor that is added but yes, you can use a non-nut oil- I’d recommend olive oil. I have been making this recipe for awhile now and it is my go to potluck dish that people rave about all the time! Since it is vegetarian everyone can enjoy this dish. I do omit the red pepper but there’s plenty of flavor that are rich and complex. My husband love it as well. One thing I do to make my life a bit easier is pre-measure the spices into a ziplock bag and freeze them. This cuts down my prep time as I have small children and I am often ooverwhelmed with dinner prep!! Love this tip! Also, thanks for coming back and leaving a comment! Delicious! Like a vegetarian ‘butter chicken’. I doubled the recipe and it was just enough for four, as everyone went back for seconds. Maybe I’ll triple it next time so there’s leftovers for lunch. Looks and sounds delicious, will have to try this one, thank you for sharing. I love lentils, easy and delicious extra protein and fiber and they go so well with so much! Great flavors, thanks for the recipe! 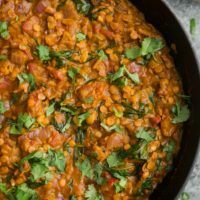 This is my new favorite red lentil dish! The balance of all the spices in the paste is PERFECT. I love this dish and I can’t remember how many times I cooked it! Absolutely my favourite, every bits! Awesome delicious recipe that packs a punch of flavour! Even my carnivorous husband was impressed by how delicious this vegetarian meal was. I served it with home made naan breads (which were more challenging than the curry itself). Thanks very much for inspiring me to cook healthy tasty meals! OMG! This is now at the top of my best food EVER list! I just used ground cumin/coriander .Also, I used all the masala paste & used extra cocnut milk instead of broth. It’s so creamy & rich in flavour. A definate make again recipe. We made this for the first time about 7 months ago. Straight away it became one of our top two dishes and we literally make it ALL THE TIME. It’s so so delicious. Although I do tend to put a lot more lentils in! Brilliant recipe – today was the first very cold day here, so needed something warming. I didn’t have spinach but it still worked a treat, I am looking forward to tomorrow’s leftovers. Love your site, always find lots of inspiration. Greetings from Belgium! One of the best meals I have cooked! Thanks for the easy to follow recipe. I froze a few servings for leftovers and ate it with homemade naan bread. Yum! And the best part is that I have leftover masala paste so I can make more this weekend. Yes! I love the flavour of this curry, it’s amazing. I’ve had it 3 times now. Makes a hearty main meal with some rice but also works really well as a accompaniment to other Indian dishes. Thank you Erin for this delicious recipe. I love the masala flavors. I grew up eating meat, potato, a vegetable and always a dessert. My family didn’t use a lot of different spices (salt, pepper, cinnamon, garlic powder, oregano and basil) were very common. So, needless to say, I have several shelves with a big variety of spices and herbs. This combination along with the red lentils, tomatoes and coconut milk is addictive. Can’t wait to make it again. Silly question, but by ‘coconut milk’ are you referring to the thicker stuff you often buy in a can to put in curries, or the stuff that comes in a carton as a milk substitute? Canned! I usually label the other ‘coconut beverage.’ Not a silly question at all- can be confusing! I have made this Red Lentils and Spinach in Marsala Sauce so many times. We truly enjoy the flavors and it smells so wonderful. It’s a keeper for sure. Thank you Erin.